Today I have a new powerbank to look at by Aukey, if you have been frustrated with the lack of ports or options in what your current powerbank has, this one fixes that by supporting nearly everything you would want in one small 10,000mAh powerbank. It supports USB-C PD for upto 18W charge, Qualcomm Quickcharge 3.0, and good old MicroUSB if you want too. Thanks to Aukey for sending this to me to take a look at. Packaging is simple on this powerbank, and not too big. It’s a simple brown cardboard box with the name and an outline drawing of the powerbank along with a few of the things it supports. On the inside the powerbank came in the semi transparent plastic bag, and you got a USB-A to C cable included as well for recharging or charging your supported device. Predictably the powerbank is made of black plastic. The top and bottom cover are a lightly textured mat plastic. The ring around the edges are a glossy black plastic. Both seem to scratch fairly easily. Length came in at 146mm, width at 74mm, and width at 14mm. I weighed it at 193.9 grams. The powerbank is rigid and didn’t crack or creek. On the top edge you have a button to turn the powerbank on, and check battery power level from it’s 4 white LED’s. On the top you have the Quick Charge 3.0 port with orange internals, the USB-C port in the middle, the standard USB-A port on the other edge, then around the corner you have the microUSB for charging if you wish. As I mentioned in my opening, this Powerbank supports all the standards you hope for in a modern powerbank to charge a wide variety of devices as fast as your device allows. First and most important to me on a modern powerbank is the support for USB-C Power Delivery. In this case it’s good for 18W. That is a good amount of power to charge your phones, gaming systems, etc fast, but it would take considerable time to charge your laptop assuming your laptop can trickle charge at 18W. This also works for recharging the powerbank itself if you have a compatible charger. It also supports Qualcomm Quickcharge 3.0 on a USB-A port for supported devices. You can recharge the powerbank via USB-C or via microUSB on it’s side at 2A speed. For my runtime info I used my EB Tester, and put a load on the battery at 3A at 5V (15W load) and the powerbank did this at a steady state for 112 minutes, I then reduced load, to be 1A at 5V (5W) where it ran for another 20 minutes. Total measured capacity was 6086mAh or 30.57Wh, the stated total capacity was 10,000mAhh or 37Wh. So my measured efficiency was just about 83% which isn’t too bad with the losses due to voltage changes. The charger is capable of charging multiple devices as well. I can pull at 2A load on the USB-A port while fast charging my Note 8 via USB-C. 18W however isn’t enough power for my Dell XPS 13 9350 to begin charging via USB-C.
For me this is my new medium capacity lightweight powerbank for traveling. I like the thin size, as it makes it easy to slip in a pocket with my Note 8 or other large screen phone. It also has the protocol support I am looking for with devices that don’t support USB-C PD and the flexibility to recharge via USB-C PD or MicroUSB for legacy support. These things along with a fair price add up to be a great little powerbank across a large spread of devices. Aukey has a pretty good reputation for customer service and product quality, if there is a problem they will take care of you, so I have an expectation this will be a reliable powerbank for many years to come. Ravpower has a new large capacity 20100mAh powerbank that’s QuickCharge 3.0 capable, and has USB-C. Thanks to them for sending it to me to take a closer look at. If you are interested I have links to their new online direct store in the video description below. RavPower has done a nice job with the packaging of this power bank. Everything comes in a decorated cardboard box, inside the cables and bag are in one small box, and the powerbank is in another. You get the manual and Happy/Not Happy card as well as warranty info. Accessories include a mesh bag, a short USB-A to MicroUSB cable, as well as a longer one and a micro to USB-C adapter. A native USB-C cable would have been a nice touch here. The powerbank is built from black plastic, with some mild texture on it. With the size of this powerbank I don’t think it has 18650’s inside, instead I think it’s a large Lithium pouch or series of pouches. If only I had an xray machine to see in side. Very closer to the size of my Note 8 with a case on it in terms of foot print. It’s a bit thicker. I measured it at 80mm in width, 172mm long, and 22mm thick. Weight comes in at 374.7 grams. The Qualcomm Quickcharge 3.0 format was adopted in 2016 and is able to charge up to 18W (9V @ 2A), it’s big selling point is charging a large percentage of the battery in a short amount of time. QC 3 speeds this up a bit over older versions but also adds a lot of smaller steps. To be work both the charger and device your charging need to be QC 3 compliant. While QC 3 is a proprietary format, several manufacture specific charging specs seem to be unofficially supported. So for my runtime test I ran a test a 5V @ 3A until it stopped then moved to .25A till it stopped and I got a total capacity of 12.25Ah, for a total energy of 60.95Wh. This is decent efficiency from the labeled 74.3Wh after considering voltage step up. Voltage was very stable during this test with average voltage being 4.97V which is good. This was all over 4.71 hours. Recharging of this powerbank can be done more than one way. You have the USB-C port which does work to charge it but not particularly fast at only 7W or so in my test despite it saying it can accept 3A at 5V. It’s not USB-C PD compliant for the input. It also offers MicroUSB input that supports Qualcomm Quick Charge 3.0 and this is the fastest way to charge the powerbank. It’s capable of 5V-12v at 2A. In my testing I used an Anker PowerPort+ charger with QC3. Charge rate for most of the charge was 21.14 total watts or (2.899A at 7.295V) this still took quite a while to charge up 20100mAh, about 6 hours. While not the fastest charging powerbank of this size I have, it’s pretty respectable for such a large capacity without having USB-C PD charging. The manual isn’t great on this powerbank and doesn’t have a full list of specs, but specs are listed on the powerbank itself. Simple but I like that this has all the output modes and input modes supported on the back. Not all power banks do this. QC 3.0 really makes a difference when charging or discharging. If you don’t have one I definitely recommend picking one up from Ravpower, Anker, or Aukey, or another reliable brand. Not USB-C PD compliant for recharging. So it only charges at 7W. The RavPower 20100mAh QC3.0 powerbank is a good powerbank from a brand with a good reputation for quality. It offers huge capacity in not a huge footprint. While I would like to see USB-C PD compliant power bank for faster charging/recharging you do have to upgrade to a different model to get that. Charging and recharging with QC 3.0 means it’s pretty quick assuming you have a compliant charger (Not all will be). 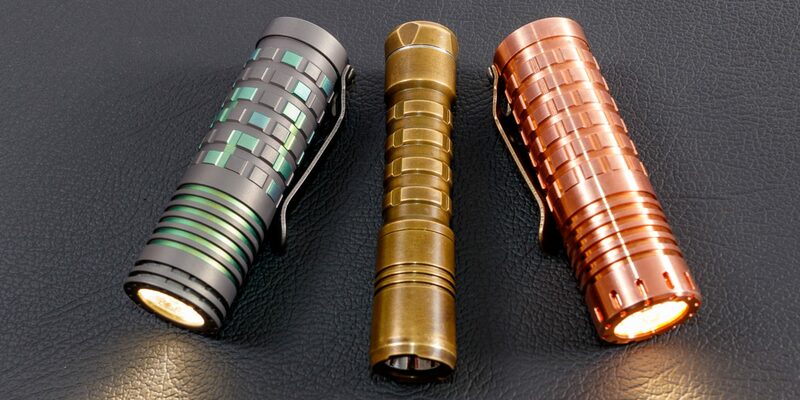 Folomov is a newer flashlight and charging company that has put out many products in 2017. This is the first of their products I have had. It’s the EDC-C4 and it’s more than just a flashlight. Thank to Folomov for sending this to me to take a look at. This light is made from a black anodized aluminum. The anodizing is smooth and has gloss to it. The tail cap is flat, and non magnetic. It will tails stand without a problem. Knerling on this light is a square pattern that’s medium grip. The clip is tail only and is removable but not reversible.The head is just ever so slightly larger. You have the main button which has an LED under for charging status. Opposite that is the cover for the micro USB charging port. I am a little worried about this rubber cover as it’s only attached at once place and easily stressed. This light is only rated for IPX-6 meaning it’s rated for rain, or high pressure stream but not full submersion. The lens is slightly recessed and fairly thick glass. It does not look to have anti reflective coated glass. The reflector is smooth and the LED is nicely centered in the middle. I measured length at 100mm, width at the narrowest is 22.5mm and at it’s widest is 25.5mm. I had a few cosmetic issues with the Folomov C4 I received. First the rubber over the main button had one corner that was not all the way into the body of the light. I was able to mostly squish it back into place. Folomov gave me some pictures to show how it’s assembled in case I wanted to do that. The other issue I have is the flat parts of the body tube don’t line up with the button or charging port on the light. I can rotate it manually but doing so disables the light. I think this is just my example because I have looked at other reviews and photos out there and it doesn’t seem to be a problem. This light uses a Cree XP-L V6 LED in cool white. It has a fairly large dome on it. It has a pronounced hot center and minimal spill. I didn’t notice any tint casts or major artifacts in the beam. Runtime did decrease significantly after about 3 seconds. I believe there is a timer for turbo. After that the light ran on High for another 105 minutes roughly slowly decreasing in output. At that point it was a full decline to zero relative output. The light does have low voltage protection on the battery that will shut off the light to stop damaging the battery. I measured the battery at 3.20V when LVP kicked in. According to the manual, the ratings and runtimes given were with a higher capacity 3400mah battery but that’s not what ships with the light (2600mah). This is a bit deceitful on Folomov’s part. The UI on this light starts at the lowest mode which is 10 lumens, and goes to medium, at 75 lumens, high at 200 lumens then turbo at 1200 lumens. If you keep pressing the mode button it then starts going down in reverse, so 1200, 200, 75, and 10. Mode spacing could be improved as there is quite a bit of difference between 200 and 1200 lumens. This light also has a Strobe, SOS and Beacon function. You can get to them by double clicking. To change within strobe double click again and to exit click once. This light have lockout mode by a fast triple click to lock or unlock. I spent a decent amount of time testing this light as a powerbank by charing various phones. Using the included cable you use the Micro USB side to plug into the light and then the female full size USB-A connector to plug your own cable in and charge your phone or device. I was able to charge an old Note 4 from 20 to 94% on the included cell. This I thought was decently efficient on the 2600mah included cell. When I measured this with my USB power meter speed of charging a phone was 1.2A and total watt hours was 6.48WH. When the light shut down charging the battery was measured at 3.13V. The flashlight got decently warm during this time too reaching 96F on a non contact thermometer. When charging your phone this can act as a flashlight just in a reduced manner. To charge the light itself you can use a standard microUSB cable or use the included cable and plug the male end of the USB-A into your power source. The switch blinks red until full where it’s green. This is a slower way of charging. This light can use and charge standard 18650 batteries, flat tops, and button tops without issues. Lengthwise this is really short light for being powered by an 18650 and USB rechargeable. Being an 18650 it does have a bit of girth to it but it’s certainly on the smaller side for 18650 lights. THe clip will rotate on the light but it’s minimal. It has a large area at the top to fit jeans in but is missing a ramp so it gets stuck a little. I didn’t have an issue with this light turning on in my pocket due to the longer press needed to turn it on. This came in a full retail packaging. The box is a black and orange combination with important specifications on the rear and sides. Inside is a plastic tray that the light comes in. It includes the light, the included Folomov 18650 battery (2600mah), unique charging cable, lanyard, and some instructions. No holster is included. Small size for being USB rechargeable. Its just slightly longer than the Emmisar D4. Flat top batteries, and button top batteries work for the light and powerbank features. Uncommon/Proprietary cable to use it as a power bank. Prone to being lost. I wish the flat body parts lined up with the button and USB port on my example. This seems to be isolated. 2600mah battery is lower capacity for 2018, especially for a light that can act as a powerbank. The ratings and runtimes given were with a higher capacity 3400mah battery but that’s not what ships with the light. This is a bit deceitful on Folomov’s part. This is a very compact flashlight for using an 18650 and being USB rechargeable. The fact that it can act as a USB powerbank too is a nice added feature although not the most efficient. Use as a powerbank did cause the body to get warm but not dangerously hot. The light will work while charging or while being used as a powerbank but at reduced output which is important. I do wish it came with at least a 3000mah or 3500mah battery since it can be used as a powerbank. I like that you can use flat tops in it as well as button tops for all the features. I hope Folomov improves the build quality issues with the rubber flaps and aligning of the threads and body flats. For the money, output and these features it’s a decent value. This light is available on Amazon. As an Amazon Associate I may earn a small percentage from links to Amazon.